Here at WASD we like to remember Torquay folk who have made their mark on the world. 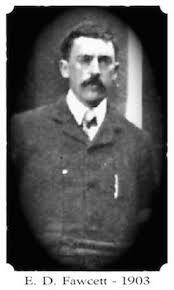 This time it’s the science fiction pioneer and St Marychurch resident Edward Douglas Fawcett (1866-1960). Along with his writing Edward was also was also an innovator in colour photography, motoring, mountaineering, aeronautics and philosophy. It was his brother, the Torquay explorer Percy Harrison Fawcett, who in 1925 led an expedition into the Amazonian rainforest in search of a fabled city… and was never seen again. Edward wrote science fiction novels that were strikingly predictive. 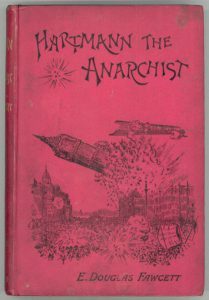 In 1893 he published ‘Hartmann the Anarchist’ which related the story of a terrorist who bombs London in a series of air raids. 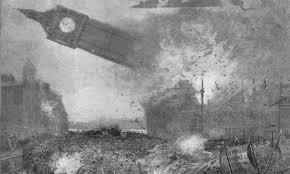 The idea that air power could devastate cities was a decade before the Wright brothers first flew, and the storyline predated HG Well’s ‘The Shape of Things to Come’ by 40 years. 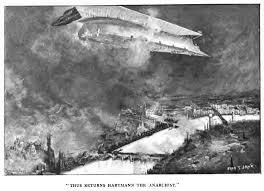 Incidentally, the illustrator of ‘Hartmann the Anarchist’, Fred Jane, became the founder of Jane’s Fighting Ships. Another of Edward’s books ‘The Secret of the Desert’, or ‘How We Crossed Arabia in the Antelope’, was possibly the first fictional account of an armoured fighting vehicle – two decades before the first tank appeared.